Positive Change to the AMEX Platinum Cards! Have an AMEX Platinum card? AMEX has updated one of the cards’ little-used perks and made it much more useful! Via View From the Wing, AMEX has expanded their International Airline Program. And most folks will benefit from these changes! Especially if you can find a good deal on Premium Economy, Business, or First Class tickets. Here’s more about the details of the changes to AMEX’s International Airline Program. And what it means for you! In the past, folks with an AMEX Platinum card, like The Platinum Card® from American Express, The Platinum Card® from American Express Exclusively for Mercedes-Benz, The Business Platinum® Card from American Express could get 2-for-1 full fare Business or First Class tickets through AMEX’s International Airline Program. But it usually wasn’t the best deal, because those full fare tickets cost often twice as much as regular discount fares. But now, instead of the 2-for-1 deal, cardholders will get a discount on ANY Premium Economy, Business, or First Class ticket on participating airlines. Like Delta, British Airways, Emirates, Air France, and more! To make a reservation, folks with the AMEX Platinum card can call 800-525-3355. And folks with the AMEX Business Platinum card can call 800-553-9497. Plus, if you use your AMEX Membership Rewards points to Pay With Points to offset all or part of the cost of your ticket, you’ll also get a rebate! 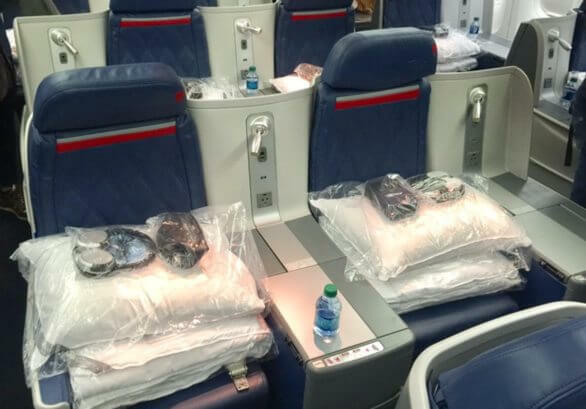 If you can find a fare sale on Premium Economy, Business, or First Class tickets, using this perk could definitely be worth it! Plus, it never hurts to compare prices to make sure you’re getting the best deal. So if you find a qualifying ticket that fits your travel plans, I’d suggest calling American Express to see what type of discount you can get. A commenter on FlyerTalk reported a savings of ~$500 on a Business Class ticket between Seattle and London! If you want to know more about these cards, you can check out my review of the AMEX Platinum Business card here. And read more about the personal AMEX Platinum card here. With American Express’ updated International Airline Program, folks with the personal or small business AMEX Platinum card can get a discount on ANY Premium Economy, Business, or First Class ticket on participating airlines. Including Delta, British Airways, Emirates, Air France, and more! The discount varies, but it’s good for up to 8 tickets. So if you find a qualifying ticket that fits your travel plans, it’s worth calling American Express to compare prices. And to make sure you’re getting the best deal! Do you plan on taking advantage of this new perk? Let me know in the comments! Do you know if the cards issued in Brazil have access to the Priority Pass? I love this new feature with the American Express Platinum card. I have had my card for about a year now and I keep finding new ways that it is saving me money when traveling. Can I pay with points on this deal? If so, can I stack the discounted ticket, paying with points, and getting 50% (for now) back? In addition to Jimjon’s question, can we get this discount with the 2-for-1 deal? Thanks!